WatchFast is designed for two things: to rapidly sort through huge numbers of pictures, video clips, and music files, and to play slideshows that include video as well as pictures. With WatchFast, you can open a folder with thousands of files and rapidly sort through them keeping the gems and tossing the trash. Not only can WatchFast play slideshows mixing both pictures and video clips, but you can also have it play clips from large video files without having to do any editing. WatchFast can play several slideshows at once if you want to fill your screen with a variety, or you need to quickly review many video clips. Mac users: Download with Safari. Not all browsers know what a DMG file is. When sorting a batch of new files, you can press the “F” key for each file you don’t want to keep. That flags the file and turns the filename red in the list. Later, you can move them all into the trash. The files you keep can then be sorted into the correct folders by dragging-and-dropping them onto the appropriate preset buttons. Using WatchFast in conjunction with NewzScape is the only way to keep up with the high volume of files being posted to Usenet picture newsgroups today. In the old days, you could mosey along with Outlook Express, looking at one picture at a time. Not any more. Today, specialized tools are needed to make sure you can handle all of the files without dedicating your life to the project. When you start WatchFast for the first time, there will be some hints to tell you how to make your first Player and how to get your first preset button loaded. 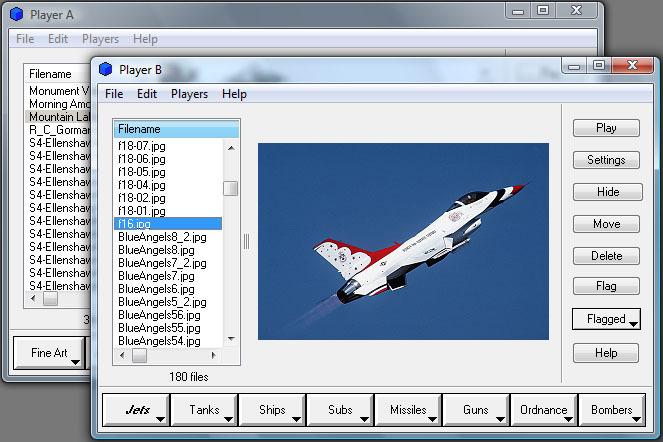 You can repeat those procedures to create several players with many folders assigned to their preset buttons. You can move files by dragging the picture or movie and dropping it onto another preset button. 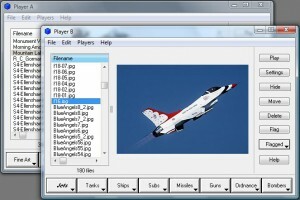 You can play several slideshows at once by making several players. On the Player window, click the Settings button, and then the Keys tab to see what keyboard commands are available. Make sure to check out the “Flag” system so that you can rapidly tag files to be deleted later. This is a great leap forward over PixPlayerPro for when you are reviewing a large batch of newly-downloaded files and will only be saving the good ones. There is a very cool “Play List” feature located on the “File” menu. There is a very cool “Jump to Middle” feature located in the Player settings. This makes sorting through video files and MP3s much quicker since you can identify them faster. Mac OS X – Use the new program in the DMG to replace your current one. You can just drag it from the DMG to your WatchFast folder. Make sure not to touch your WatchFast.sdb database file since that is where all of your settings are stored. Windows – Just run the WatchFast installer.